On my last visit to Half Priced books I picked up a couple of books from my reading list and without spoiling it for you I will share my opinion of the first book " Act Like a Lady, Think Like a Man" by Comedian/Actor and Author Steve Harvey. To sum it up in just a few words this is a self help book written for women designed to assist with the troubles of dating, relationships and finding the right person. At first glance of the title you would think to yourself that it's pretty self explanatory when in fact it's not! 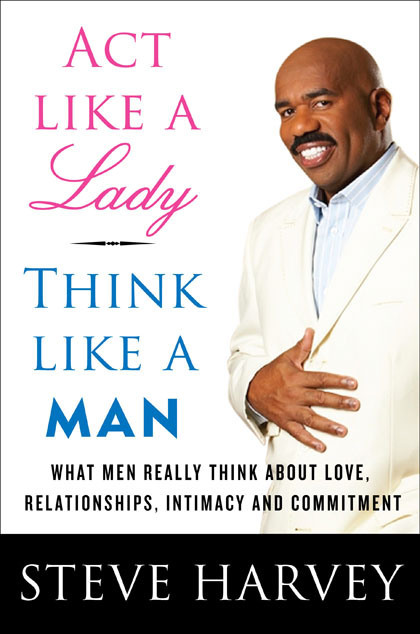 In this book Steve Harvey breaks it down step by step giving you the when, what, where, and how. Mr. Harvey’s inspiration for this book was his daughters. Seeing their relationship downfalls inspired him to help all women by providing them with insight into how men think. My favorite chapters are three and nine. My favorite point that Mr. Harvey makes is that if a man truly loves you and wants/see’s you as his woman he will do three things: 1.) Protect, 2.) Profess, 3.) Provide.